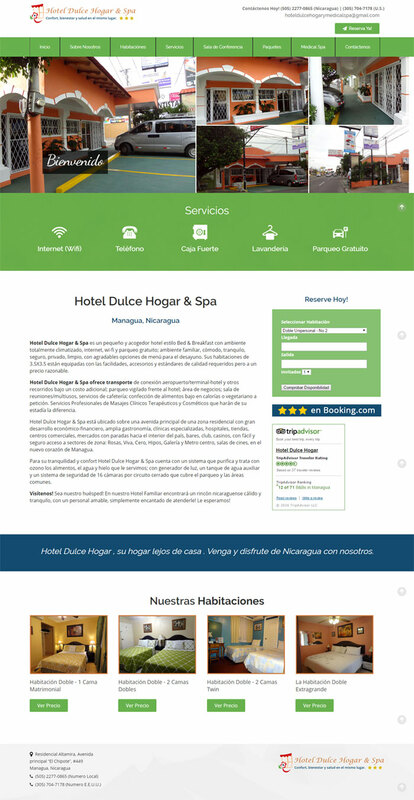 When their website crashed, Hotel Dulce Hogar & Spa came to us for help. They initially believed that their crash was due to them not updating their Joomla template and plugins in a long time. When we first investigated the situation, we saw that we were able to login to their backend administrator panel but their platform was outdated. We attempted to update it but it still did not fix any of their problems. We then logged into their cPanel, we realized that their website had been hacked and compromised – even worse it received a Google penalty because of it. After discussing our discoveries with the client, we advised that the best course of action was to start from the beginning. We kept the website on the Joomla platoform, as the client was use to the backend. We kept the style simple and easy to navigate with inviting colors to keep the look fresh and clean. We added plenty of authentic pictures to show visitors exactly what to expect upon arrival and once the website was complete we submitted an appeal to Google to help remove the manual penalty and reinstate the website into good standing. Hotel Dulce Hogar & Spa, is a hotel in Managua, Nicaragua that offers affordable rates to tourists traveling through the country. The hotel itself offers four different style rooms that can cater up to four guests. Within you will find a quaint garden where you can do some light reading in, a spa to help you relax after a day of traveling and authentic food options to give a true taste of the culture. For more information visit http://hotelenmanagua.com.